As a Veteran, you have entitlements. In the Commonwealth of Pennsylvania, death certificates are at no charge (presently $20.00 each) for the veteran, spouse, and dependent children. From the federal Government, you are entitled to a burial flag, burial space and grave digging with grave marker in Department of Veterans Affairs (VA) run cemeteries, and your spouse may be buried with you at no charge. A concrete grave liner is also provided at no charge. 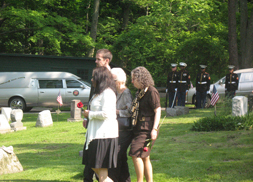 A military Honor Team is provided at any cemetery, either VA or private. If one passes away while in a VA run facility, transportation fees are paid by the VA, and if you have service connected disabilities, additional funds can be received. If burial is in a non-government cemetery, a veteran’s marker is provided in either solid bronze or grey granite. Installation is the grave owners’ responsibility. A copy of discharge and/or DD214 is required. These are not “free”, you, as a veteran have earned these entitlements if you have served a minimum of 150 days active duty after training and/or received a honorable discharge or under conditions other than dis-honorable.